Does the sound of that dramatic hiss of steam and that aroma of seared steak wafting through the air conjure up an image of the server approching your table with the most perfect sizzling dish ever made? Well, you’re in for a treat, here’s our list of places you can get your sizzler fix from. When you ponder about restaurants that serve the best sizzlers in the city, Peter Cat should legit be the first name to pop up. 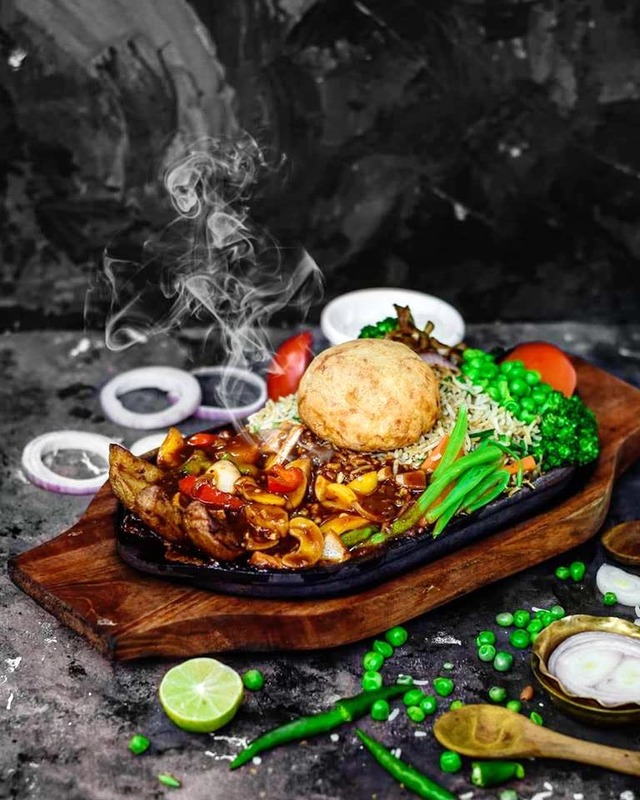 Mostly famous for its sizzling sizzlers, Peter Cat’s chicken steak sizzler is pure nostalgia, while the tandoori mixed grill sizzler (must try) is a mouth-watering wonder. If you happen to visit with a big group, order the house special (chicken steak with sausages and liver), and of course how can one forget the legendary chello kebab. This bike-themed cafe at the Platinum Mall on Elgin Road has everyone impressed with its vibe, decor and lips-smacking food. The Mexican chipotle chicken sizzler (served with Mexican rice, tortilla chips and pico da gallo) makes for a pretty sizzling venture. Love sizzlers? Go to Mocambo - one restaurant that is on everyone’s wish list. The sizzlers served here are a class apart, as they call it, ‘out of the fire, and into the pan’. Be it the Surf & Turf ( a combo of fresh prawn and tender chateaubriand beef steak with pepper sauce) or pork sirloin steak or mutton hamburger steak, just the sizzler menu here will leave you salivating. The varieties of vegetarian sizzlers this restaurant serves are absolutely incomparable. We love the Italian Baked Sizzler, Tandoori Paneer Shaslik and the Spicy Sa Po Schezwan Vegetable Sizzler. Want to try something different? Go for the Paneer Ka Baap Sizzler - a crazy combo of paneer tikka, kali mirch tikka, hariyali paneer tikka and lal mirch tikka – that stays true to its name. Love seafood? Love sizzlers? Marry the two and we have just the place for you. The Grilled Seafood Sizzler at Oasis will hit all the right notes on a rainy Sunday or winter afternoon. The Pork Sizzler and Indian Mixed Grilled Sizzler in both vegetarian and non-vegetarian options are also amazing. On a diet? Don’t fret, the low calorie charcoal grilled sizzler will ensure you don’t binge too much. Located just beside the What’s Up cafe in Southern Avenue, Fung Shway’s special torched sizzlers are the bomb. Be it tofu with exotic vegetables or lobster or squid, you can get your sizzlers laced with three different choice of sauces - szechwan, chilli rum and tamarind honey. Hungry anyone? Although the ambience is not so fancy but the sizzlers they serve definitely are. We loved the chicken fajita sizzler and the mixed sea food sizzler. We also like that their choice of background music is mostly retro that adds to the over all modest decor. Their sizzlers come with generous dollops of the most amazing mashed potato ever (creamy and delicious). Try out the grilled bhetki sizzler and thank us later. Hola literally translates to ‘hello!’ and Hola Cafe is all about saying hello to good food and a chill vibe. Go there for the grilled chicken steak sizzler served with a choice of BBQ or red wine sauce and herbed rice. It’s all in the name (and in the sizzlers!) The sizzlers here will leave your tastebuds as well as pockets super happy. You have a lot of choice both in veg and non-veg. We loved the mexican sizzler (served with herbed rice) and sizzling pasta (served with garlic bread).